Tired of annoying back rolls! Having excessive bulging on your back can make you feel self-conscious of your appearance; it can make it difficult for clothes to fit properly and can make it very uncomfortable for women to wear bras. Unfortunately, weight loss and fitness plans don’t always help with excessive laxity of the skin throughout your body. If you feel like you are at your goal weight but can’t seem to rid yourself of this stubborn area, this may be a procedure you want to consider. The upper back lift is an outpatient surgical procedure under general anesthesia. 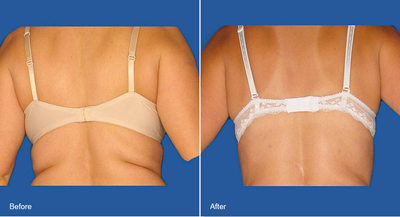 An incision is made near the bra line to remove excess skin and fat from the back to create a slimmer, more defined back contour. You may be required to wear a compression garment following the procedure for 1-2 weeks. This will help to minimize swelling and support your tissue as it heals. Patients can typically return to work after 7-10 days. Scar therapy will start around 3 weeks following the procedure and full recovery including strenuous activity can resume after 6 weeks. If you have any questions please call Dr. Richard Lee at (949)548-9312.